An Enterprise Rent-A-Car branch in Canada. Photo courtesy of Enterprise Holdings. 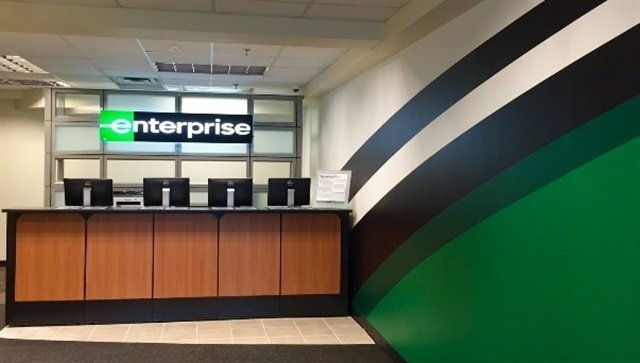 Enterprise Holdings has expanded its transportation network in Toronto area. The company has opened a new location near Union Station in downtown Toronto and another office near Square One Shopping Centre in Mississauga. “We are excited about expanding our market and opening new locations in the heart of the financial sector across from Union Station, as well as in the community of Mississauga,” said Steve Tudela, corporate vice president of Canadian operations for Enterprise Holdings, which owns the Enterprise Rent-A-Car, National Car Rental, and Alamo Rent A Car brands. The new branch near Union Station not only serves local Enterprise Rent-A-Car and Alamo Rent A Car customers in the downtown core, but also thousands of commuters from regional carrier GO Transit and the local Toronto Transit Commission, according to the company. This branch is also connected to the PATH, Toronto’s underground pedestrian walkway. The new branch in Mississauga serves Enterprise Rent-A-Car customers and is open seven days a week, according to the company. Currently, Enterprise Holdings operates eight locations in downtown Toronto and seven locations within the Mississauga area.